Bridgewater, Massachusetts, is included in the Massachusetts Town Vital Records project Early Vital Records of Massachusetts to 1850, begun November 1901. 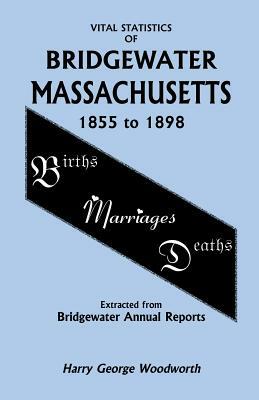 Birth, marriage, and death records were compiled and published, with the Massachusetts Legislature passing a law in 1902 agreeing to purchase 500 copies of each vital records volume, and distribute them to public libraries and historical societies. These volumes became very important for vitals research, as sources of information are also given. But, for those searching for ancestors, the words "to 1850" says it all. Researchers have to contact town hall for vital records after 1850, with some towns requiring an actual visit by the researcher. One source of vital records away from town hall is found in the town's Annual Report. Using this series requires a trip to the library and a year-by-year search for ancestors. This book combines many years into one easily searched volume. There are almost 20 years of births, and around 40 years of marriages and deaths, ending with 1898. The alphabetical listing of names reveals family groupings and multiple generations extending from the 18th century. The liberal usage of ladies' maiden names is a significant aid to researchers.